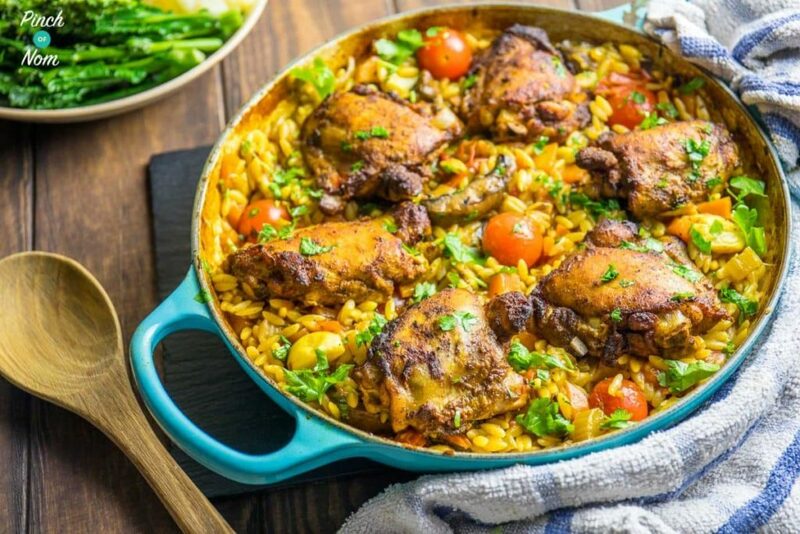 Autumn is here, but this Syn Free One Pot Mediterranean Chicken Orzo is one of those Slimming World dishes that reminds you of summer! This Syn Free One Pot Mediterranean Chicken Orzo is also ridiculously easy to make. It takes about 10 minutes to prep, and you just throw it in the pan and then in the oven. In case you’re wondering, this isn’t rice. Yes it looks like it, but orzo is actually a type of pasta. The best thing? Pasta is a Slimming World Free Food, which means you can eat this without a worry in the world. Some of you love this Syn Free One Pot Mediterranean Chicken Orzo recipe! 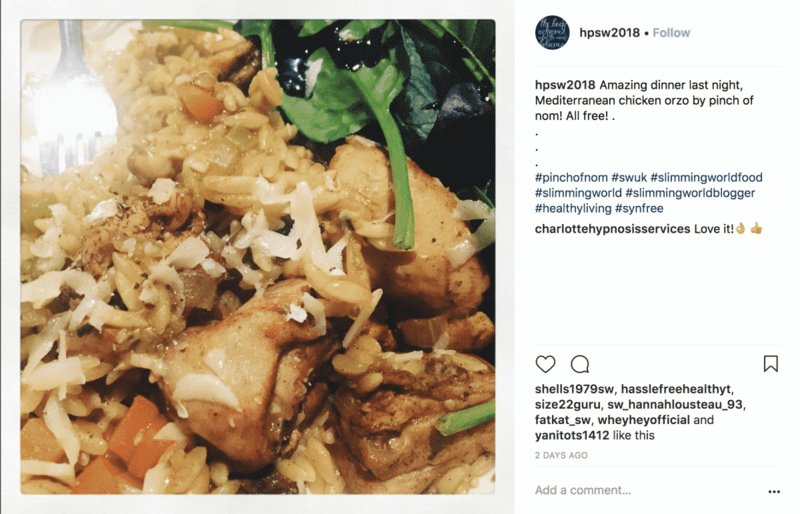 One of our Instagram followers @hpsw2018 made this dish and loved it! 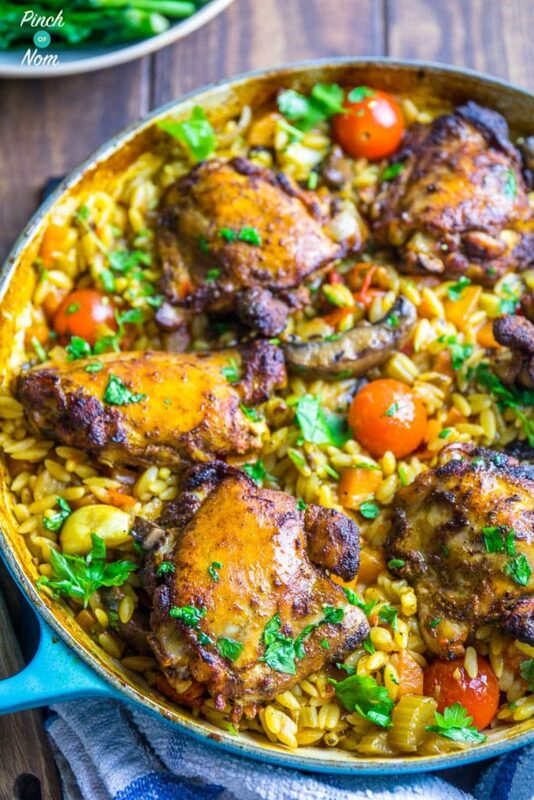 If you make this Syn Free One Pot Mediterranean Chicken Orzo recipe, snap a pic and hashtag it #pinchofnom — We love to see your creations on Instagram, Facebook, & Twitter! 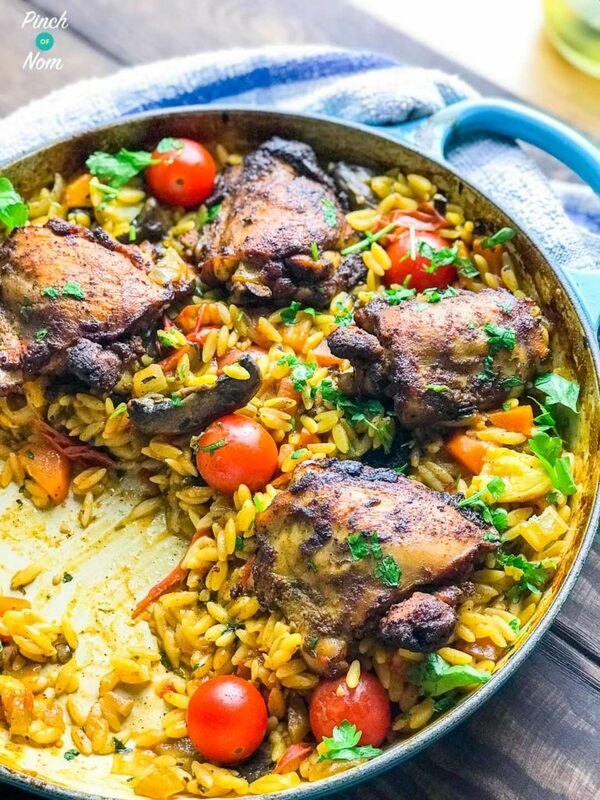 What Do I need to make this Syn Free One Pot Mediterranean Chicken Orzo? First and foremost you need a sturdy casserole pot. 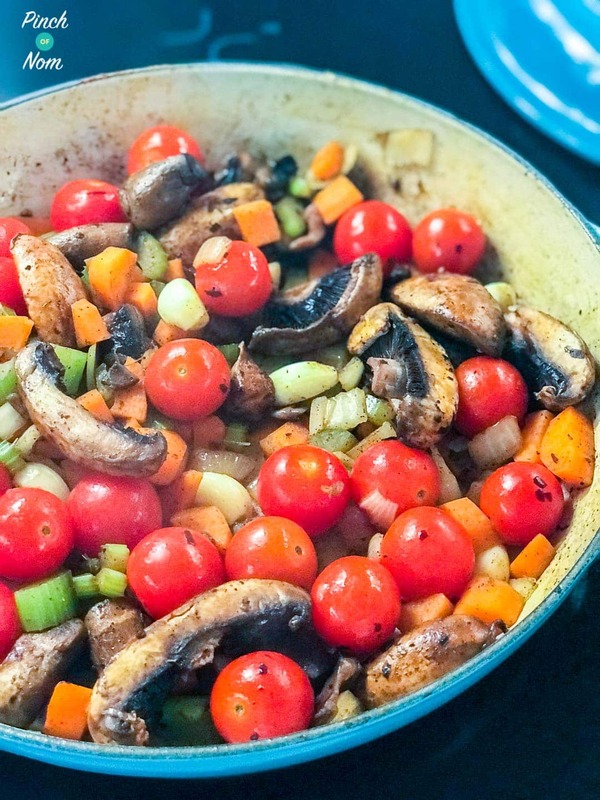 We use ours at least once a week, and cook everything in it from stir fry’s to one pot dishes like this Syn Free One Pot Mediterranean Chicken Orzo. We used a Le Creuset shallow casserole for this, but a friend of ours swears by the VonShef cast irons ones. They’re pretty damn good. Not mixed spice, ALLSPICE! It’s nothing like mixed spice – and really shouldn’t be substituted as such! If you don’t have any Allspice, I urge you to get some. It’s amazing paired with rosemary and thyme. You also need to use some Frylight if you’re going to keep it Syn free! Whenever we need to replace oil in cooking we use Frylight. 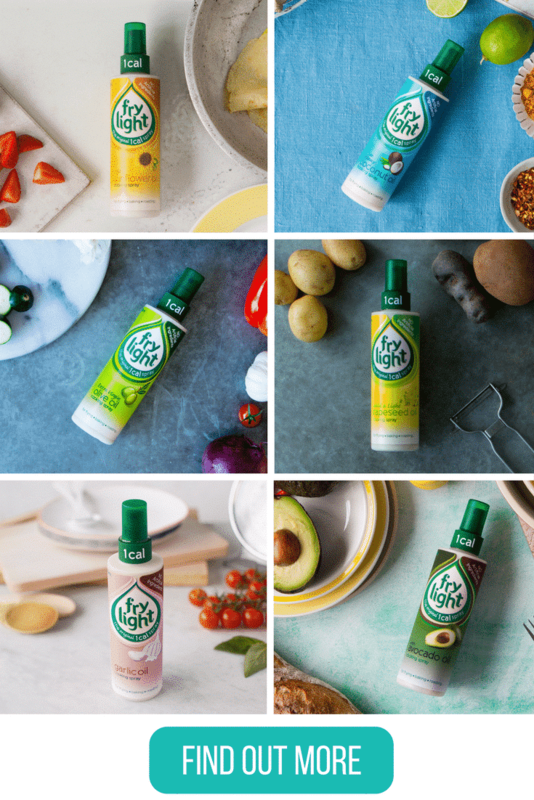 Perfect for everyday frying and cooking, it delivers exactly one calorie per spray, which makes it Syn free. 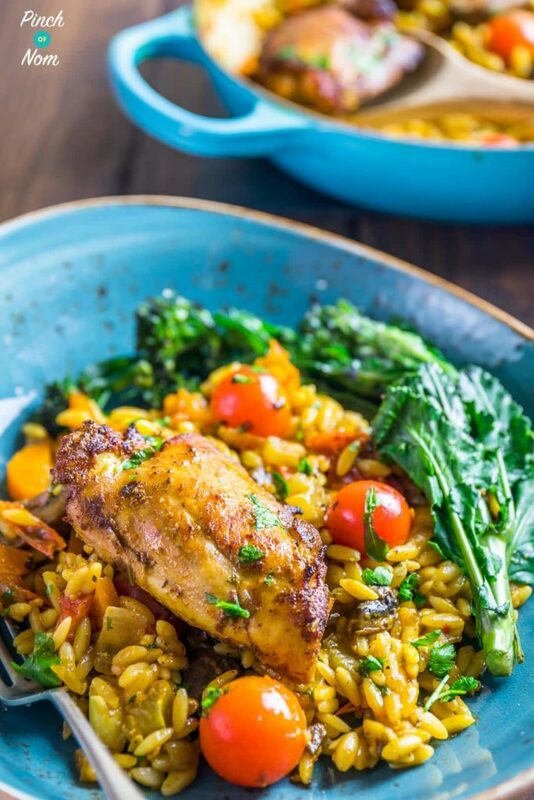 The Sunflower or Olive Oil flavours are ideal for this Syn Free One Pot Mediterranean Chicken Orzo recipe. You also need some Orzo! you can find it in the pasta aisle in your local supermarket. It’s cheap, inexpensive and is fab in soups and salads! How many Syns are in this Syn Free One Pot Mediterranean Chicken Orzo? 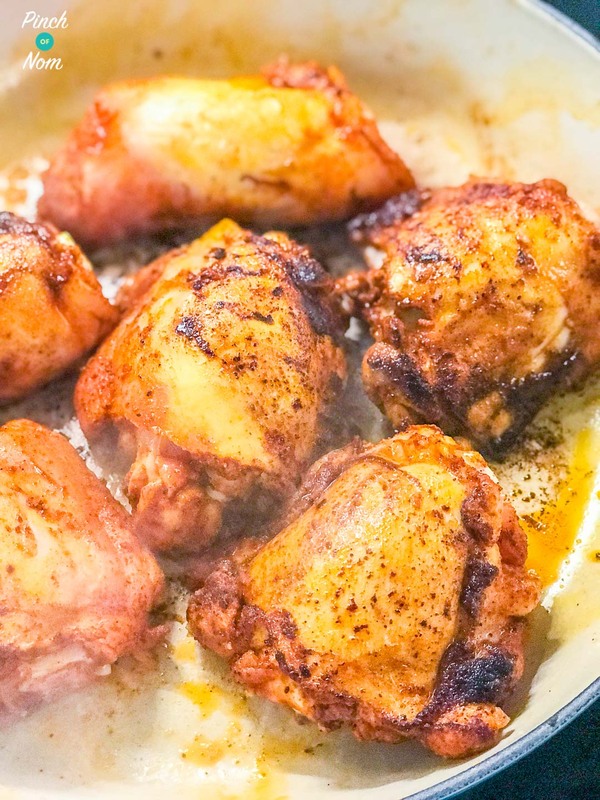 Take the skin off the chicken thighs before you cook them. Use a spray oil like Frylight which is Syn free. If you add a stock pot instead of a stock cube, make sure that you use a Syn free one. 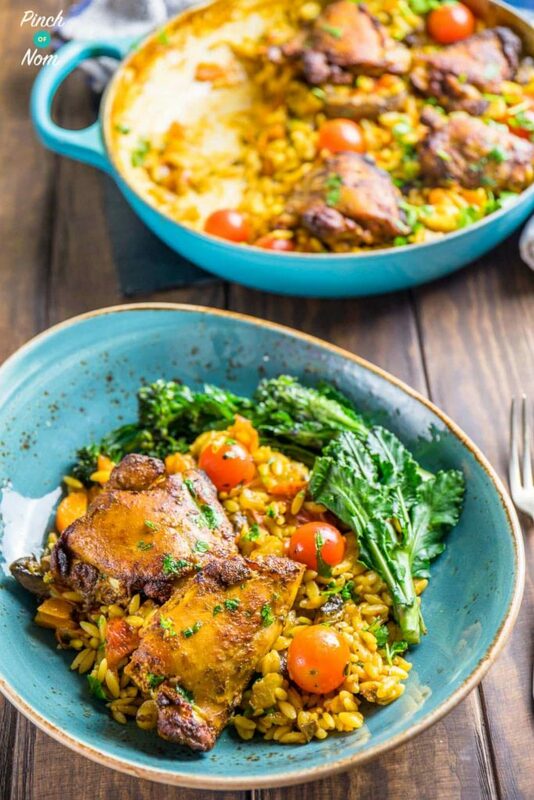 How do I make this Syn Free One Pot Mediterranean Chicken Orzo? Coat the chicken thighs the paprika, ground allspice, turmeric and salt and leave for 10 mins. In the meantime chop the veg. Spray a large pan with some Frylight and heat gently. Add a few more sprays of Frylight to the pan, then fry off the onion, carrot, celery, garlic and mushrooms until the onion is soft. Add the tomatoes, lemon juice, 100ml of the chicken stock. Return the chicken back to the pan and place in the oven with a lid on (or covered with foil) for 30 mins at 180C. Carefully remove the pan from the oven, add the orzo (make sure to mix it all in! ), parsley and the rest of the stock. Stir, and return to the oven for 20 mins – with the lid off!!! Can I freeze this Syn Free One Pot Mediterranean Chicken Orzo? Yes you can, but as always, please make sure you freeze it as soon it’s cooled, and make sure it’s piping hot all the way through after re-heating. Looking for some more pasta ideas? 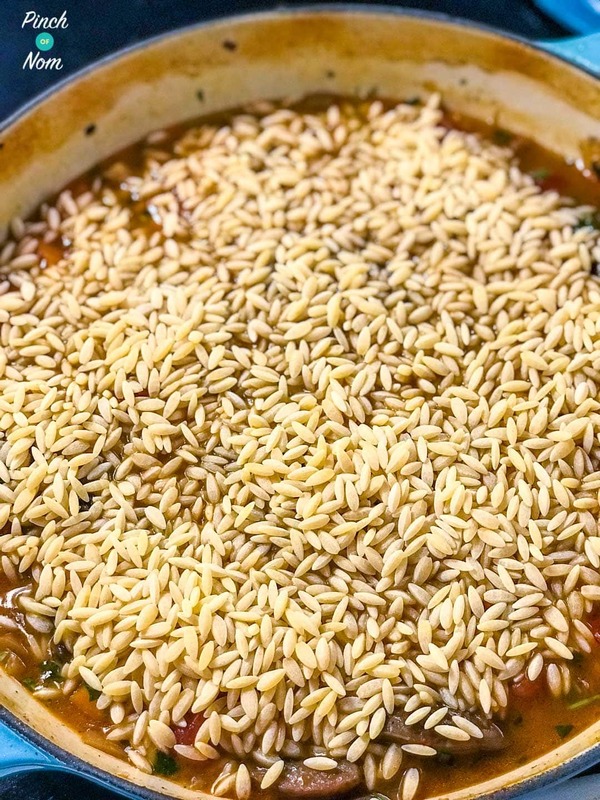 Carefully remove the pan from the oven, add the orzo, parsley and the rest of the stock, stir, and return to the oven for 20 mins - with the lid off!!! Just a beautiful recipe to an already extensive, marvellous collection of food. Thanks, Manoir! Glad you enjoyed it. Would you mind rating the recipe on the website? We would be super grateful!! Can I make this with chicken breasts instead? Advice please, I really can not stand mushrooms or whole / solid tomatoes only passatta. Are there any swaps I could make to this recipe? 6 whole garlic cloves seems a lot to me. Is this dish very garlicky? I plan on making it tonight and would need my children to eat it. As the garlic cloves are added whole, rather than chopped or sliced, they give the dish a pretty mellow garlic flavour. You could remove the garlic cloves from the portions you dish up to your children if necessary, as they’re pretty easy to pick out. Hope that helps. Thank you 🙂 I’ll try that. Thank you so much for this recipe. Made this tonight for the first time. So quick to prepare, and so full of flavour. Absolutely love it. My 87 year old mother in law, who doesn’t eat very much at all, said “I really like this stuff underneath the chicken”, and had a second helping. High praise indeed! I’m making this, this evening so just to double check I add the orzo uncooked? Yes, add the orzo straight from the packet. It will cook in the stock, be ready to add more stock or hot water as necessary. Hope this helps. Hi there just after some advice please I’ve bought the all spice the exact one as the pic it smells really heavy with clove just like 5 spice just wondering if its supposed to be this way? Allspice seeds, which are ground to make Allspice seasoning, have quite a complex flavour of many different spices including cloves, nutmeg, cinnamon and pepper. Perhaps you could make your own spice mix, using less of the flavours you’re not so keen on. Hope this helps. Hi. Can you use curly parsley or dried parskey instead of fkat leaf. This looks absolutely amazing. And perfect for the beginning of Spring (which it is in Australia) – bright and colourful like Spring, but with a ‘comfort food’ factor. Can’t wait to try it. Thanks for getting in touch. We’re just heading into Autumn here, but you’re so right about the ‘comfort food’ factor! We’ve had lots of really positive feedback about this dish. Hope you enjoy it! 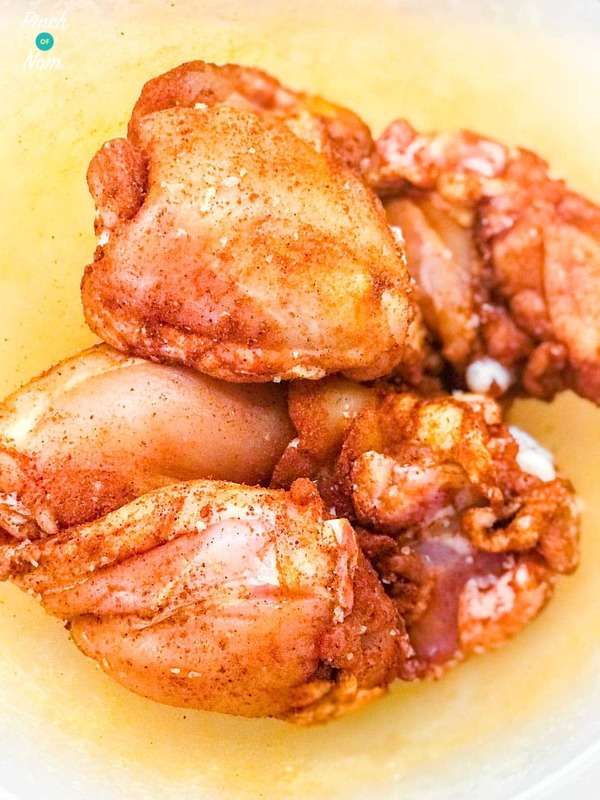 Are the chicken thighs boneless? We used bone-in, but you can use boneless chicken thighs in this dish. Just check to make sure they’re thoroughly cooked through. you say will be syn free if using stock pot. I thought stock cubes were syn free? also in your ingredients you have stock cube? The blurb says that IF you choose a stock pot instead of a stock cube, make sure you choose a Syn-free stock pot. (There are some, e.g. gravy pots, that are Synned.) Hope that makes sense. Firstly thanks for your fantastic recipes. I am in the process of purchasing a cast iron pot. Having never had one do you prefer enamel coated or just cast iron. Do either affect flavours?. Kay and Kate use the Le Creuset casserole, which is enamelled. As mentioned in the article, the cast iron ones are pretty good, too. I bought an enamelled lidded casserole from Sainsburys, which works well. It really comes down to personal choice and budget! Cooked this last night. Very tasty but I thinking would prefer it with rice. Would I do it again definitely yes …..
Just eaten this with Hubby. Was exquisite. Hubby loved it. Was very moist and tasty. Definitely a keeper. Just made this and it was delicious thanks! I doubled up on ingredients and wondered if it can be frozen or not? The pasta element of this dish probably wouldn’t defrost/reheat too well, as the pasta would go very mushy. Hope that helps. That’s a great bargain! 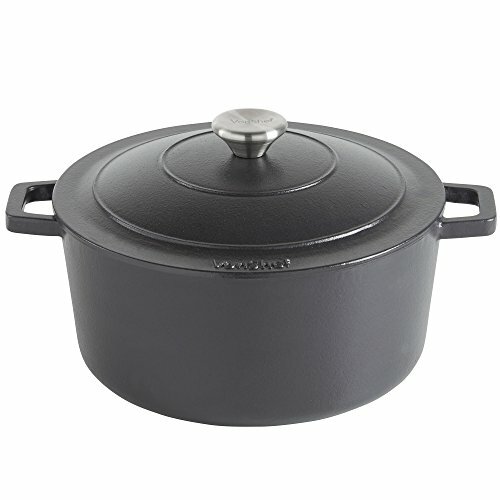 I picked up my cast iron lidded casserole for half price a couple of years back, when Sainsburys did the same offer. They’re lovely, aren’t they! Delicious recipe and I always follow but found a bit dry – at what stage could I have added a bit more water? You can add a little additional stock or boiling water in that last 20 mins of oven cooking. If you check after 10-15 mins, you can add extra liquid for the last 5 minutes or so. Would like to try this recipe st the weekend but my guests have gluten free diets. If I were to make it with rice what type should I use and would the timings be similar? Thanks. Several people have been in touch and told us that they’ve used rice and been successful. I would think long grain or basmati rice would work. You’ll need to keep an eye on the amount of liquid absorbed. If you check it halfway through the final cook time in the oven, you could maybe have some stock or boiling water ready to add, if necessary. Made this last night and was delicious, will definitely be making again…….and again……and again! Thanks for your comments. So glad you enjoyed it. This recipe is a new favourite in our house, too! I dont have enough Orzo, without going to the shop. Any alternatives, Rice? 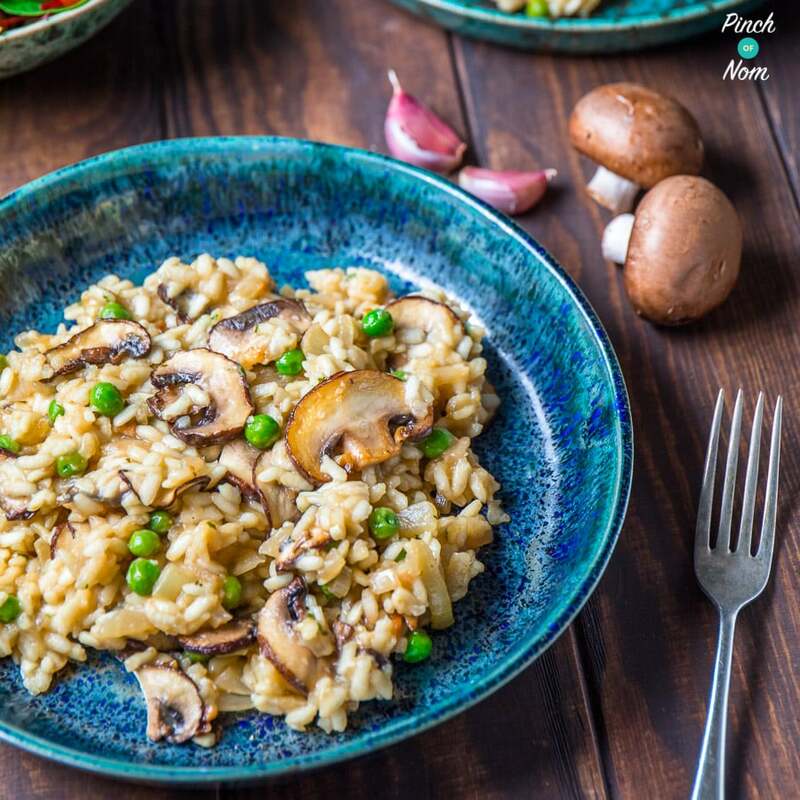 Several members of the Facebook group have made this recipe with rice instead of Orzo. You may need to add a little more stock or boiling water to stop the dish from getting too dry. I’m making this tonight, how much Orzo do u use for the recipe? I don’t have any allspice is there anything else I can use instead? I made this for our supper this evening. It did not look like your picture!!! However it tasted great. I will make it again, but will tweak the spices more to our tastebuds. Could I use rice instead of orzo? Hey this looks really tasty! How many people does this serve? I would like to cook it for my family of 5? The cooking times would vary in a PKP cooker, and it wouldn’t get that lovely golden top. It’s probably best to stick to the original method, though could be made in advance and reheated thoroughly. My husband made this dish for tea last night and we all loved it! 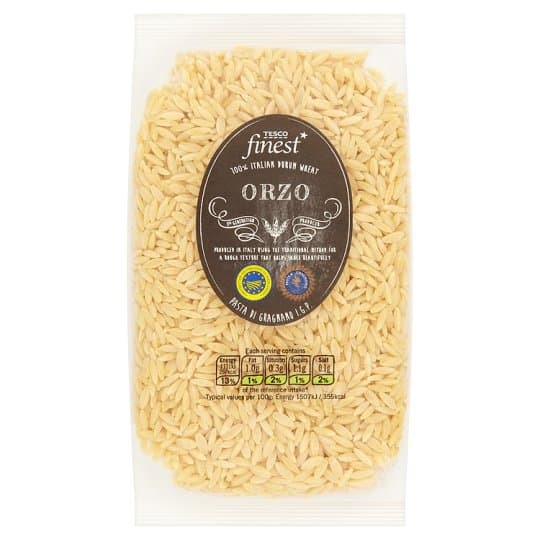 Never even heard of Orzo before, it’s Gorgeous! Thanks so much for another amazingly tasty and fab recipe! So glad you enjoyed it, Fay! Hi – can you suggest a gluten free alternative to Orzo that would work with the receipe? My daughter would love this but she’s coeliac. Thank you. Aw man, this is THE most delicious thing ever. A hit with the whole family, easy to make and full of flavour. Definitely a keeper! It’s a big favourite in our house too. So glad you enjoyed it! What are the best stock cubes to use please? So glad you enjoyed it, Michelle! Making this today. I think I have read somewhere about the oven temperatures that you use, but can’t remember where. Are your temp for fan ovens or standard ovens? Made this last night. I did enjoy it, but won’t make it again with the allspice as not keen on it. Will try again and experiment with other spices/flavourings more to my taste. A great all in one dish though! Yet another ‘Pinch of Nom’ delight. We loved it, my first foray into Orzo and girls it will not be my last. Thank you for your amazing recipes, my repertoire is expanding but my waistline is not,thanks to you! Hi, just finding my way round for the first time….fab site. I’m not very good with this cooking malarky but looks easy enough even for me so going to try this recipe tomorrow, Would it be ok to cook in a pyrex dish? Hi, many thanks for the recipe. I was planning on making this tonight, but don’t have a casserole dish that can go in the oven. Can I use a pot initially and transfer into a Pyrex to cook in the oven do you think? Many thanks! Do you put the orzo in raw or cooked? What a fantastic menu made a smaller portion pleased I did else I would have eaten more. Made two meals ideal for me being on my own. So tasty never had orzo before going to see if I can make a pudding with it scrummy. Hi. Can you use chopped pieces of chicken for this? I only have cubed chicken and wondered if it would work the same? 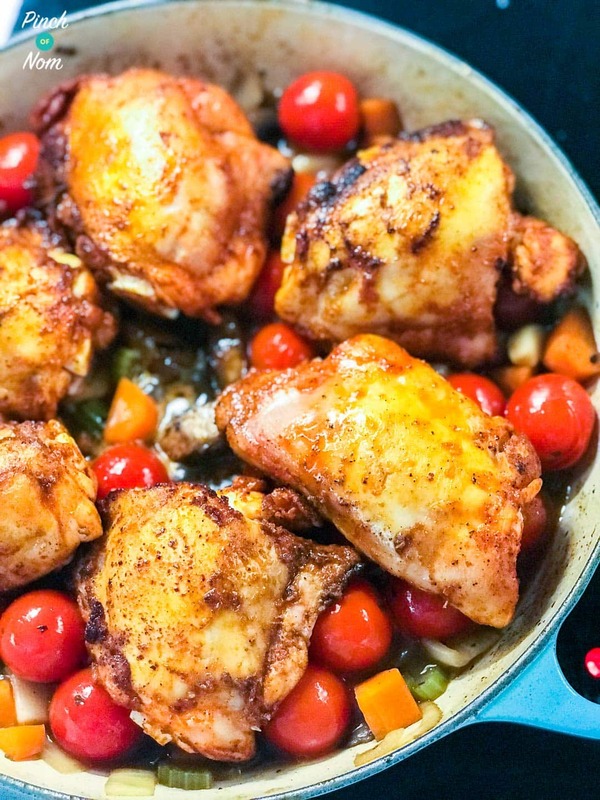 We use chicken thighs in this recipe to stop the chicken drying out and overcooking. Diced chicken would probably overcook and become tough. Fantastic recipe and so easy. Highly recommend it. So glad you enjoyed it, this is a big favourite in our house too! Made this twice in 2 weeks, absolutely delicious! A big hit with all the family. We had a salad with it (cherry tomatoes, red onion, gherkin, beetroot and carrot) Thank you for the recipe – look forward to trying out some others from the site. Wondered if this could be prepared / made earlier in the day and just put back in the oven for the last 20 mins, in the evening or would I need to add more water etc? i don’t have a suitable dish to cook this in the oven.. could i cook it on the hob instead? I’ve got a couple of fussy eaters so made this with carrot, sweet potato and butternut squash, and used tinned tomatoes instead of cherry tomatoes – was delicious! So glad you enjoyed it, Lucy! Can I slow cook this?? Low, for 8 hours? If so , do I put the orzo in with everything else? Delicious dish really enjoyed making it and eating it. Do you perchance have a rough macro count per portion for this dish? Hi, planning on making this tonight but I don’t have a casserole dish? Would a normal pyrex dish work as well? Made this last night for a family meal and I didn’t want to be slaving over the stove. The spice mix smelt a bit strong when I put it in a bowl to coat the chicken, but once cooked it had toned down to just give a lovely flavour. I did tweak slightly and used a tin of tomatoes as I don’t like fresh and reduced the stock by 200ml (I made a huge pan using 500g of pasta and 1kg of chicken) it went down really well with most having a small second helping. I even had to send a link to the recipe. Thank you PON for another great one! So glad you enjoyed it, thanks for letting us know! It’s a real favourite in our house, too! Hi I really want to try this in my instant pot, what is the recommended time to cook? The cooking times would vary in an Instant Pot, and it wouldn’t get that lovely golden top. It’s probably best to stick to the original method, though could be made in advance and reheated thoroughly. This recipe was absolutely delicious. I shall be cooking the dish regularly and the whole family loved it. Just made this precisely to the menu apart from using 3 chicken breasts (split into 6 pieces). Thanks for the lovely feedback, Roy and Eleanor! I’m new to slimming world so just finding my feet. Are the chicken thighs free, can only find chicken breast. Go all the ingredients to make this, just a little unsure about the thighs. OMG!!! This was amazing. Never had Orzo before and was a little apprehensive especially as I have a fussy eater husband. We both throughly enjoyed it and will be definitely having it again. Can’t wait for the Pinch of Nom recipe book to be delivered. So glad you enjoyed it, Karen! 🙂This is a big favourite in our house too!